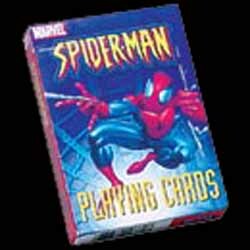 This pack of Spider-Man playing cards may come as something of a disappointment to Marvel comic fans. Character Games had the chance to do something impressive with this license, but end up producing a pack that might as well not have Spider-Man plastered all over the packaging. The quality of the cards is not that bad, but what's the point of producing a themed deck if you hardly print any images of the main character. When we buy a themed deck of cards we expect to see a different image on each card - no repeats and certainly no cards where the web slinger doesn't even appear. On the plus side, the images that are included are of good quality, and there are rules for six games, but save yourself some money and buy a standard set of playing cards.